My family is not a big fan of them. Simply because even after eating a few slices of chiffon cakes, they feel like they have eaten nothing. Me? I like them...even though I have to agree that chiffon cakes cannot seem to make me feel full. 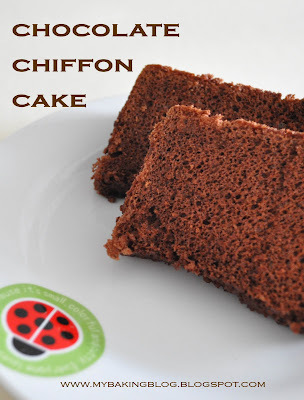 I've always wondered why chiffon cakes are usually the cheapest cakes sold at local bakeries. To me, they are the underrated ones. They are not that easy to master and they use a lot of eggs, yet they are only worth two bucks. 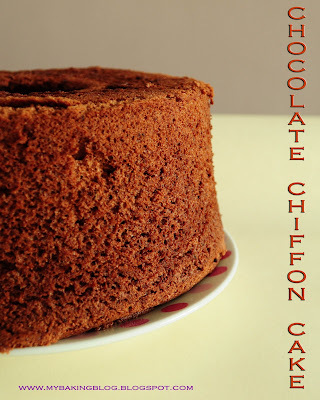 A few years ago, I made my first chiffon cake attempt. I remember I bought a pack of pre-mix since it was my first try. I had actually contemplated a long time before buying because it required something like 8-10 eggs? Eventually, I decided to risk 10 eggs. It turned out disastrous. At that time, I did not know how the egg whites are supposed to be. I remembered the batter was still very liquid when I poured it into the pan....and slowly, the batter seeped through the bottom of the pan and made a mess of my oven. It was a nightmare. That sort of gave me a phobia and put me off another attempt for several years....until this year. 3 months ago, I finally plucked my courage for a second shot. I found a recipe for Lemon Chiffon Cake which required much less eggs. It was a good try. The cake was yummy, in fact I would say honestly that I prefer it to this chocolate one below, though this is also yummy. The only problems were (1) my pan was too big for the recipe, thus my cake was not that high and (2) I did not manage to get a good shot of the cake. Therefore, I did not blog about it. I got the recipe for this cake from a fellow blogger's blog. Generally it was nice, but I think I still prefer chiffon cakes to be pandan flavoured, and I think the amount of baking powder used could be reduced, since there are 4 egg whites. My guinea pigs said the cake was soft and fluffy enough but everyone prefers pandan flavour. It is just like a default flavour for chiffon cakes. The cake turned out very high, because my pan was a little too small this time. The pictures managed to hide a few cracks but it was a satisfied and good attempt. My next attempt will definitely be pandan flavoured.